Listen to over 30 free city walks and museum tours in Amsterdam with the izi.TRAVEL Audio Guide app. Download the app and What’s up with Amsterdam’s free virtual tours of Amsterdam at home or at your hotel via Wifi and you will be ready to explore Amsterdam’s hidden gems with your phone at no charge at all. Get to know the history of the Chinese people in Amsterdam Chinatown and find out where you can find the greatest Chinese food and shops. Just east of Amsterdam Central Station, following the Oosterdokskade, there has been a lot of development. You will pass some very interesting architecture include the Amsterdam Doubletree hotel, the new public library and the Amsterdam music conservatory and Science Museum Nemo. Tour the modern architecture just east of Central Station, including the Amsterdam Doubletree hotel, the new public library OBA, the Amsterdam music conservatory and Science Museum Nemo. 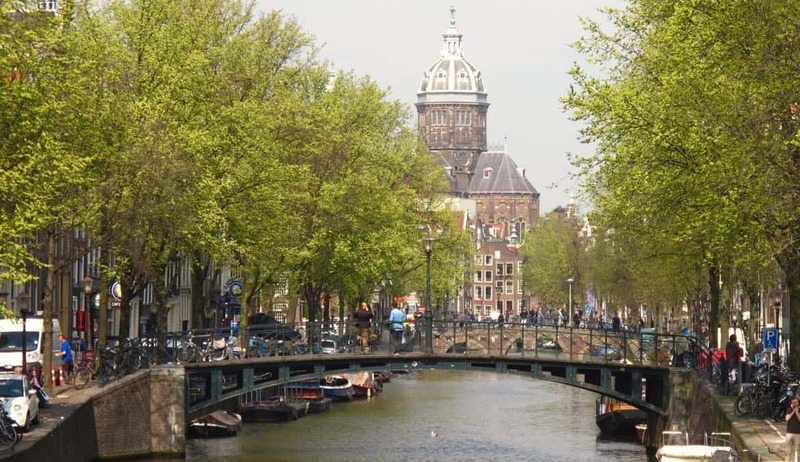 Tour the old Jewish Quarter and learn about Amsterdam’s Jewish history: from the 16th century Jewish immigrants to their disappearance after the World War II. Walk around the few buildings they left behind that tell their story: the Portuguese Synagogue, the Holland Theatre and the Jewish Museum. Enjoy the hidden secret of Amsterdam: the Western Islands, just West of Central Station. Start at Westerdok, a newly reconstructed architectural gem and move on to the Silodam an old industrial complex converted into apartment to reach the Realen Island, Prinsen Island and Bicker Island. Cross their charming charming bridges and walk along historical narrow houses in this quiet history loaden area. Just East of the Museum Square lies the neighbourhood De Pijp. The North side is bustling with people, bikes, terraces, restaurants and bars around the big Amsterdam Albert Cuyp daily market. The South side of De Pijp is a remarkably quiet neighbourhood, with broad streets, a lot of green, playgrounds and small parks. De New Pijp hides some of Amsterdam’s most characteristic socialist architecture from the 1920s known as Amsterdam School Architecture. The Jordaan Quarter is a typical Amsterdam neighbourhood with a rich history involving immigrants, poverty and social unrest. But the Jordaan is also great quarter for restaurants and shops. The tour starts at Brouwersgracht, one of the most beautiful canals. Enjoy the tour! What is izi.TRAVEL Audio Guide? izi.TRAVEL Audio Guide is multilingual storytelling platform that features over 1400 unique audio tours of more than 300 cities in 50 countries. You can listen to local storytellers on your smartphone while they let you in on the hidden gems of the city around you. There are integrated maps, videos, text, pictures, quizzes, and the app’s tourist-driven rating and review system. Communicate with family, friends, fans and followers via the app’s built-in social media sharing. izi.TRAVEL also features over 500 museum guides, which makes it indispensable for travelers and expats who want to get the most out of their cultural experience.